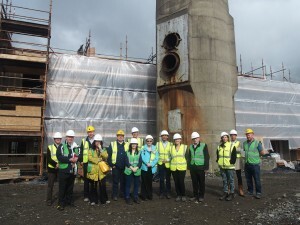 This morning the expert panel overseeing the WISER project and other stakeholders met at the Boiler House, where construction is well underway. They started with a site visit to see the progress that has been made over the past five months since the construction team broke ground in January. 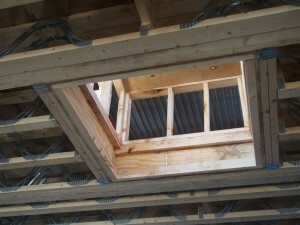 The visit began on the ground floor and highlighted a few of the many important architectural details in the building. 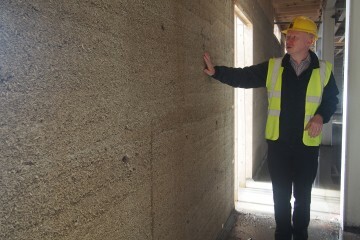 Ballymun Regeneration Limited and Dublin City Council architect Ronan Glynn pointed out the hempcrete wall insulation, visible in its timber casing, which will provide an eco-friendly insulation that not only is sourced from sustainable materials, but whose breathability also allows for a more flexible heating and cooling system that maximizes efficiency. 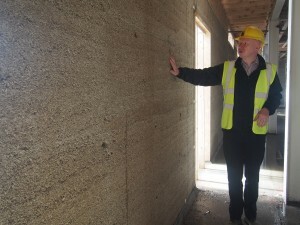 Parts of the hempcrete will be left exposed as a point of educational interest so that visitors can see the material and learn about its insulating properties. 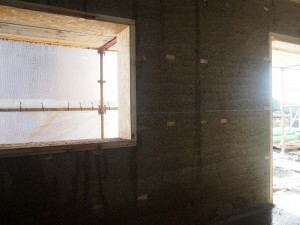 Looking upward to the ceiling separating the ground floor from the first, the stakeholders spotted one of a few portholes, which will allow visitors on the first floor to observe the reuse workshops that will be located below. 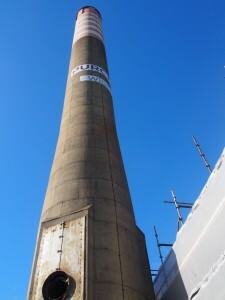 This will provide visitors with a better understanding of the upcycling process as it happens in real time. The Rediscovery Centre team also shared plans to color code all pipes in the closed-loop water filtration and circulation system, which will be left exposed, creating a services trail treasure hunt. Additionally, along with many other design and educational details that are in the works, the Boiler House will contain a gallery space to feature visiting exhibitions and sell best-in-class ecoproducts and will have a café that will serve food made with as many local ingredients as possible, both from nearby community gardens and from the kitchen garden behind the Boiler House that will also serve as an outdoor education space. 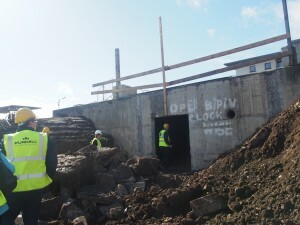 This garden,which will be connected to the first floor of the Boiler House by a bridge, will grow atop the old reservoir behind the Boiler House, whose concrete structure used to hold the water reserves for Ballymun. Empty of water now, the reservoir will provide the platform for a green space that will allow for sensory learning through direct interaction with ecological processes. It was yet another exciting and successful visit to the WISER project site, which is progressing well towards its opening day in January 2017. Participants in the site visit from the WISER expert panel were Darren Byrne from the Department of the Environment, Community and Local Government, Shane Colgan from the Environmental Protection Agency, Aideen O’Hora from Sustainable Nation, Derek McGarry from the National College of Art and Design, and Ciaran Murray, chairman of the Rediscovery Centre. Other stakeholders present included Derry Solan and Mary Taylor from Dublin City Council, Paul McAuliffe from Fianna Fail, and Dessie Ellis and Cathleen Carney Boud from Sinn Fein. 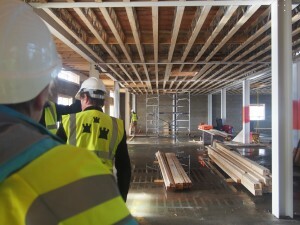 The visit was facilitated by Ronan Glynn from Ballymun Regeneration Limited and Dublin City Council, head architect of the WISER project, and Rediscovery Centre staff Sarah Miller, Tara Singleton, and Roger Warburton.